Home Tweet - Email a friend! - Show Print View! - My Twitter! In this diagram all the black and blue(picture and text) is my deduction of how our government is actually functioning now(Mar 2019}. Not how it is supposed to. The red "X"s mark the power and information flows that need to be removed to clean of the corruption. It would make the media honest. So, the public would get honest information via the media and education. Voting would actually count because the general public would have the knowledge it needs to vote themselves a credible government. That would mean the POTUS would become president again. He/she would no longer just be a figurehead. The green arrows represent power flows that would be restored. And the shadow government/NWO would disappear. • Shadow government/New World order, according to Sen. McCain, started after world war two and has been serving us very well. The NWO is not good for America. • CIA - the center of power ruling this country and others via Operation Mockingbird. • ISIS - the CIA's main project against the Western world. The NWO goal is to Establish a one world government where America is just another country. • Media & Education - Controlled to facilitate the New World order. It's the propaganda arm of the CIA. • U.S. Public - Theoretically the most powerful group of people on earth. Also, the most disillusioned folks you'd ever want to meet. • Govt - A façade shown to the American people. • And as you can see; voting does nothing until you add the Green arrow! • Pres. of the United States at best is a liaison officer to the American people. He is basically out there on his own. He has very little power to do anything. And this applies to all Presidents. Obama had a easy couple terms because he agreed with NWO. Trump does not. And G. W. Bush had no say either. • Taxes - I'd say quit supporting THEM by not paying taxes, but that is something We the People have theoretically agreed to. • Advertising - Why are We the People Supporting our own demise by buying products that are paying for the propaganda the Media produces to control us. It is a self-defeating cycle. 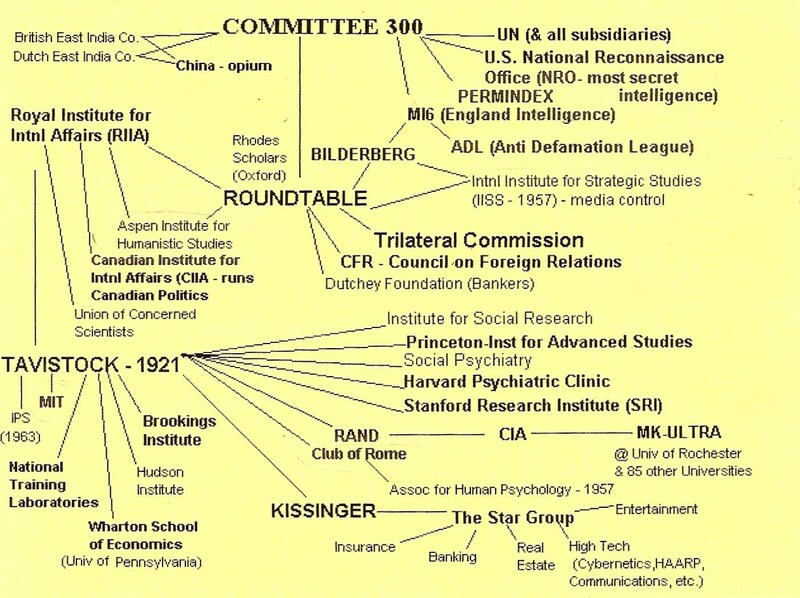 • The Committee of 300 is a group of families that run the world. 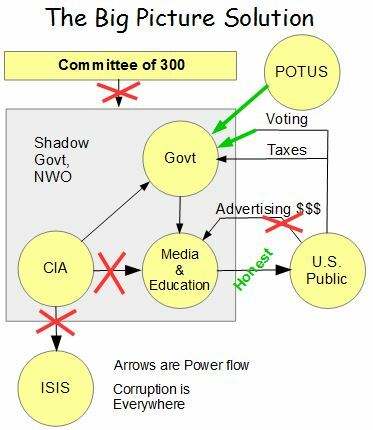 Notice in this Committee of 300 Chart, there are NO countries included. And of course there are Power struggles within the circles and between the circles. This is not cast in stone anywhere. It is just what the Left has been able to do so far. It'd be called an Oligarchy which is a dictatorship by a minority or by a few. Home Tweet - Email a friend! - Show Print View!